the trailhead to the cabin. To find the trailhead in Jackson, go through the covered bridge on 16B, turn right onto Black Mountain Road, pass the Black Mountain Ski Area and then bear right onto Dundee Road. You will see Doublehead Drive in about a mile on your left, there is a parking area there, if it is full you can park on the side on Dundee Road. From the parking area head up Doublehead Drive about 200 feet and you will see the sign for the ski trail. If you plan on hiking Doublehead please make sure to wear snowshoes and stay to the side of the trail so that the ski trail does not get postholes, which creates hazards for the skiers. The trail after 0.6 mile connects with the Old Path that leads to North and South Doublehead. In order to take the ski trail bear left or continue up the hiking trail bearing right. The Old Path is steep in sections and you will want snowshoes or light traction devices such as microspikes. Doublehead last week after one of the snow storms! Once you reach the summit of North Doublehead there are some fantastic views looking at the Presidential Range, as well as a great eastern facing view behind the cabin looking towards Maine. Since you will be skinning up what you are skiing down you will be able to prepare for the fun twists and turns this trail offers. If you would like to make reservations for the cabin you can through the U.S. Forest Service by calling 1-877-444-6777 or at www.recreation.gov. There are some great backcountry skiing resources out there, my favorite book is the Best Backcountry Skiing in the Northeast by David Goodman. This covers 50 classic ski tours in New England and New York. 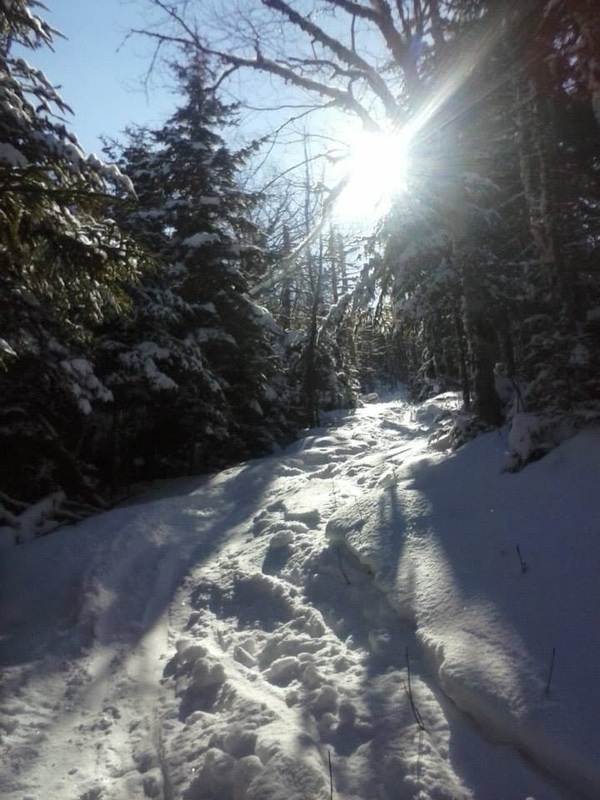 If you plan to stick to skiing in the White Mountains there is a great Winter Trails map that has some great information in the areas of Pinkham Notch, Twin Mountain and the Kancamagus. As always you can check AMC Conditions for the latest report from the snow stakes and/or call us here at Pinkham to see what we're seeing out our windows and for the best trail advice we can give you! Currently many of the trails have snow and ice on them and traction devices such as snowshoes and microspikes are highly recommended.